Clonakilty bears witness to the success of a simple policy that standard re-instatement works should never be a replacement of the existing standard but rather, can be easily stretched to deliver better quality public realm for our towns and communities. An Urban Design ‘holistic design-led approach’ was adopted for the Clonakilty Main street works delivering a new streetscape amenity out of a civil engineering intervention like the drainage scheme, which required extensive excavation along the main street thereby creating an opportunity for the reconfiguration of the streetscape, Phase II of Clonakilty 400 Urban Design Master plan. A crucial criterion was safety and accessibility where pedestrian priority is further established over the motor car thanks to the introduction of contemporary traffic calming measures consisting of raised traffic tables as shared space, quality materials and placemaking principles, already applied at Asna and Emmet Square in Phase I. The design concept is based on the reduction of street clutter and the provision of wider pedestrian zones including “mini squares” at strategic location. While improving the legibility of the street, these shared raised tables act as informal gathering place for people. Like public terraces, they are furnished with contemporary street chairs and coffee tables, inviting people to stop and use the street in many creative ways. Pocket Squares create an environment that affects driver behaviour establishing pedestrian priority over vehicular traffic and mark possible informal crossing points for pedestrians rather than a traffic dominated streetscape. Street furniture and trees are part of transition “home zone” areas designed to create enclosure and to act in lieu of bollards, following the principles of good practice universal design. 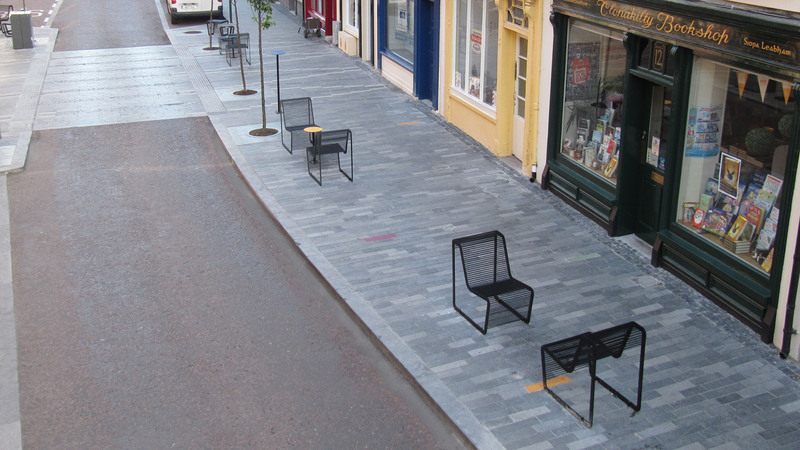 Blue Irish limestone is the selected paving as an extension of the existing Asna Square pattern with the addition of coloured recycled glass tiles that reflect the Clonakilty streetscape colours. These coloured tiles became a good engagement spark during construction, where shop owners ended up making suggestions as to the tile colour matching their shop front. Where paving materials meet the building line, the surface feature changes to create a legible transition between public and private zones. This zone also accommodates services like ESB mini pillars etc and addresses the inconsistent building line. Through better design and to great visual relief, double yellow lines and road markings have been omitted from the new streetscape as being surplus to requirements. A strong sense of civic stewardship among the local community from design stage became key during the 18 months construction period. Constant communication and clear understanding of the long term vision and mutual trust made the local chamber of commerce develop a strong sense of pride, becoming champions of the project by organizing an exceptional Street Carnival in summer 2016 with a kilometre long street dining table turning the space into a joyful celebration with people dancing, playing tennis, football, golf etc into the night. 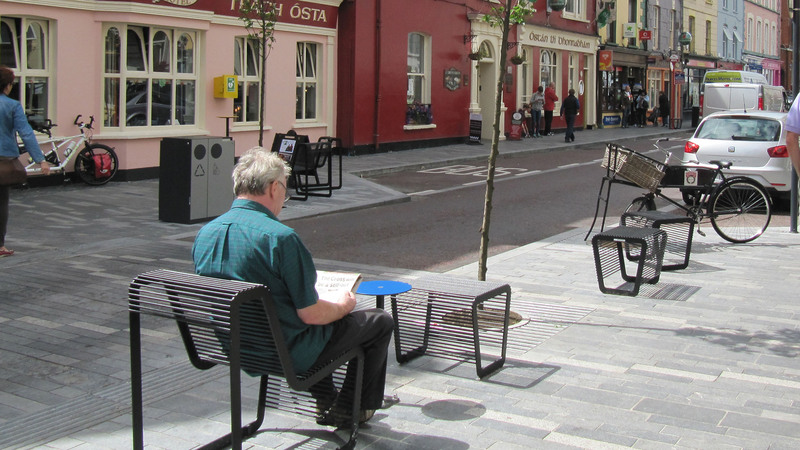 The completion of the streetscape coincided with the assessment jury visit of the Academy of Urbanism that awarded Clonakilty with the prestigious urbanism title of the “AoU Great Town 2017”. The crucial stakeholder during the design process of the Clonakilty 400 Masterplan was the local community. Public engagement was at the base of the urban design process where people participated in the design development with active involvement and enthusiasm. A great template of Collaborative Urbanism was delivered through the project starting from Phase 1 in 2013. Although initial reluctance and resistance to changes and challenges like the removal of car parking etc., the people took ownership of their new public space developing a strong sense of Civic Stewardship. The success of this can be seen from the Street Carnival event organised by the Chamber of Commerce that became champion of the new design celebrating the opening of the streetscape. 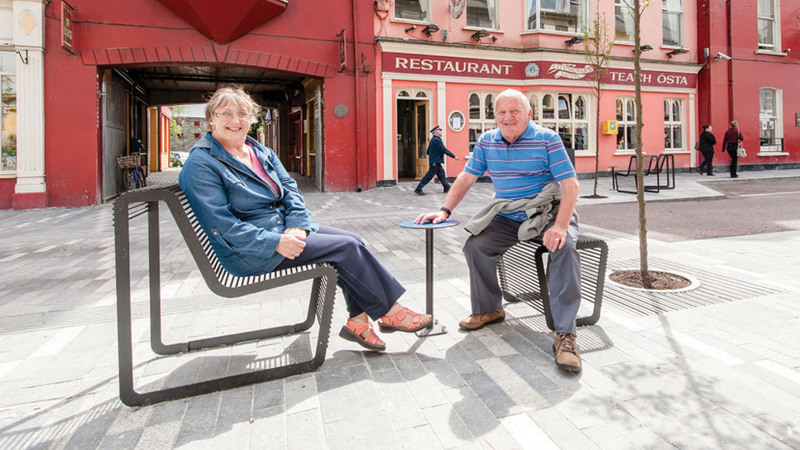 If you walk down Pearse Street Clonakilty, locals will stop you to tell you of the latest sporting local team success, or their tidy town golden medals; inviting you to join them and sit on their new street furniture, laid out for conversation. People you don’t know will salute you on the new coloured main street with “mini squares” and well preserved shop fronts, even if they have never seen you before. Follow the music of hundreds of guitarists parading the main street, you are part of the international guitar festival; The Old Costumes fair, Random Act of Kindness and Street Carnival, which are just a few of the many occasions where cars are temporarily banished from Clonakilty’s main street and the whole town centre becomes a place for public life.